Ansonia Brass & Copper Co. "Hanging Monogram", ca 1874. It has an8 day movement that strikes on a wire gong. The striking models are very rare. I had a time only model in each of the previous two catalogs. Excellent29 inch walnut case has been restored where needed and is now clean, polished. I can\'t vouch for the originality of the finials. If they are expertly made they can fool me. The zinc dial is a replacement. 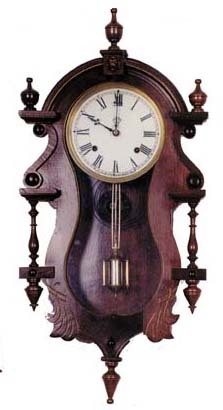 The movement, gong base, and pendulum, are signed Ansonia, and original to this clock. The gold in the etchings around the glass and edges of the case are bright and probably have been strengthened. This is 3 catalogs in a row we have had a Hanging Monogram, and all 3 have been slightly different.